Have you been out somewhere and got a call asking if you can help with a computer issue? How about a super important meeting while you are on the road or vacation? As long as you have your Android with you, you’re all set. 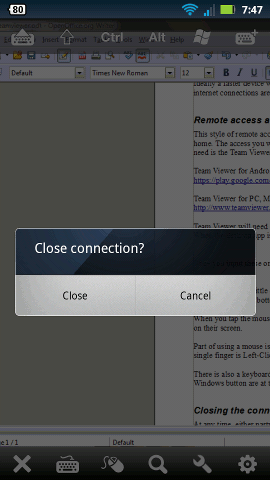 Team Viewer is the perfect way to hold a meeting or remotely access a computer from your Android. Ideally a faster device would work best for either of the options we will be talking about here. Fast internet connections are also desirable, be it Wi-Fi or a fast cellular connection. This style of remote access is a 2 person gig. 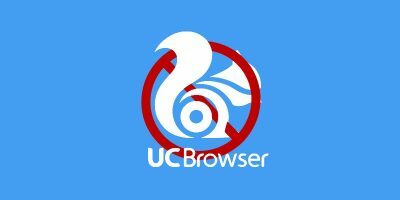 It isn’t an option to access your PC from everywhere but home. The access you will have is to control a computer in the situation of IT type help. 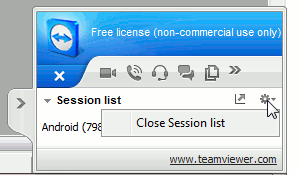 What you will need is the Team Viewer application installed in both places. 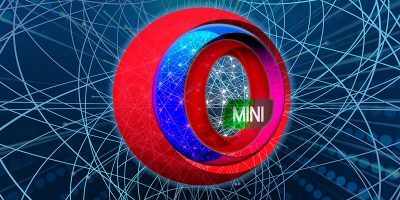 Team Viewer will need to be running on both sides and both devices will need an internet connection. When the desktop app is up and running, it will give you a ID and password. Once you input these onto your Android, you should be able to see what they see. Pretty cool huh? The controls are a little different on the Android touchscreen than you may be accustomed to. You have several icons at the bottom of the Android screen. One of them is a mouse.When you tap the mouse icon, you will see the cursor and be able to use your finger like it is a mouse on their screen. Part of using a mouse is clicking on applications and links. You have 2 options when clicking. Using a single finger is Left-Clicking on the mouse and a 2 finger tap is Right-Clicking on the mouse. 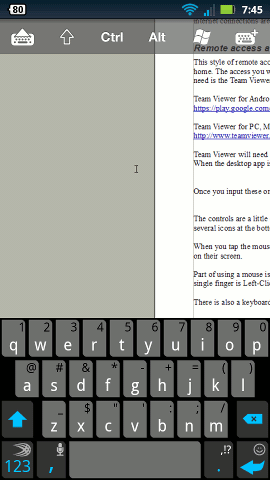 There is also a keyboard option which pulls up your Android keyboard. Buttons like Alt and the Windows button are at the top of the screen. 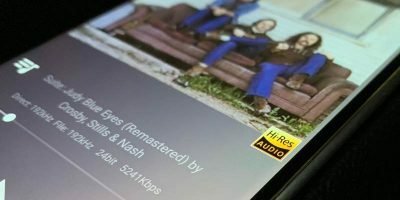 At any time, either party can close the remote connection. To do so, simply use the back button or the X on the Android. To close the connection on the computer side, click the gear icon in the session list box. 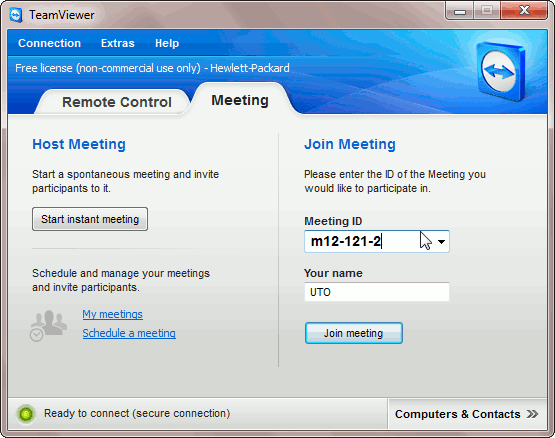 To join a meeting, the application is the same for the computer side. 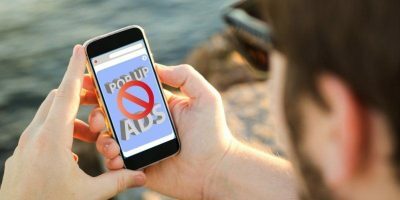 However, an additional application is used on your Android. 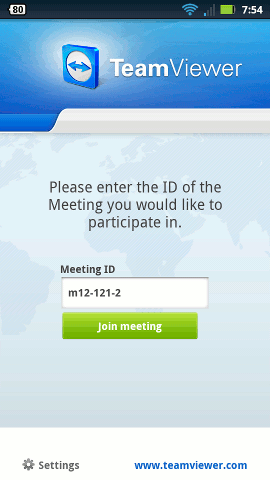 To access a meeting on your Android, you will need the meeting ID. 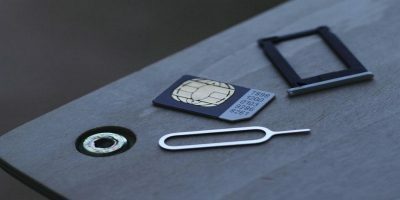 The meeting ID is the same as the individual ID when remotely accessing a computer from Android. When joining the meeting on your Android, you will have access to the audio as well as the video. Because you are likely on a much smaller screen, you can pinch to zoom in and out to better see what’s going on. The only feature not appearing to be visible on the Android side is the Whiteboard. While the screen is a bit small to complete some tasks, having access to a PC or meeting while mobile is wildly useful. Sometimes fixing a problem is as simple as a few clicks, but explaining where the non-tech savvy person to navigate to can be VERY hard. 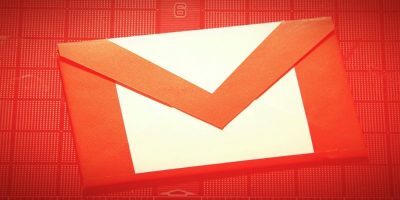 How do you remote access computers from an Android device? TV is superb for Android remote desktop needs. I’ve used it for years w/o any issues. I use it at home+work+wherever. Fantastic service. 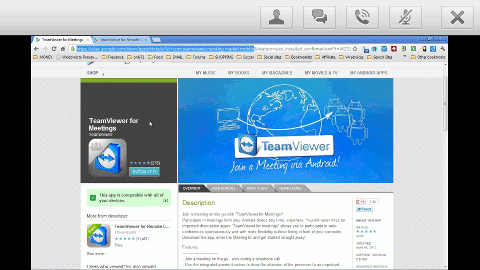 I have used Team Viewer a few times more recently and it has worked really well also.